Since the Galton Board knows you've been jonesing to see all the old, dead mathematicians in one place, within its tilting translucent walls and rolling metal balls you'll be able to witness: the Gaussian curve of the normal distribution; the de Moivre-Laplace theorem; the Bernoulli distribution; Pascal's Triangle; and Fibonacci numbers. 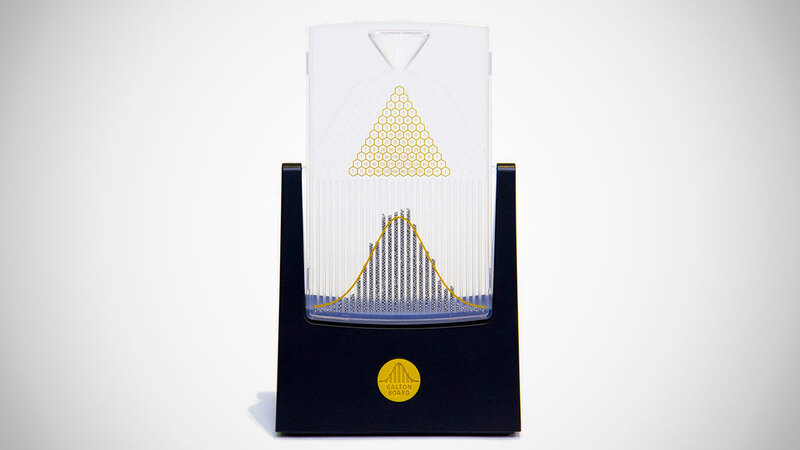 Because the Galton Board is a desktop toy depicting Math! In! Motion! 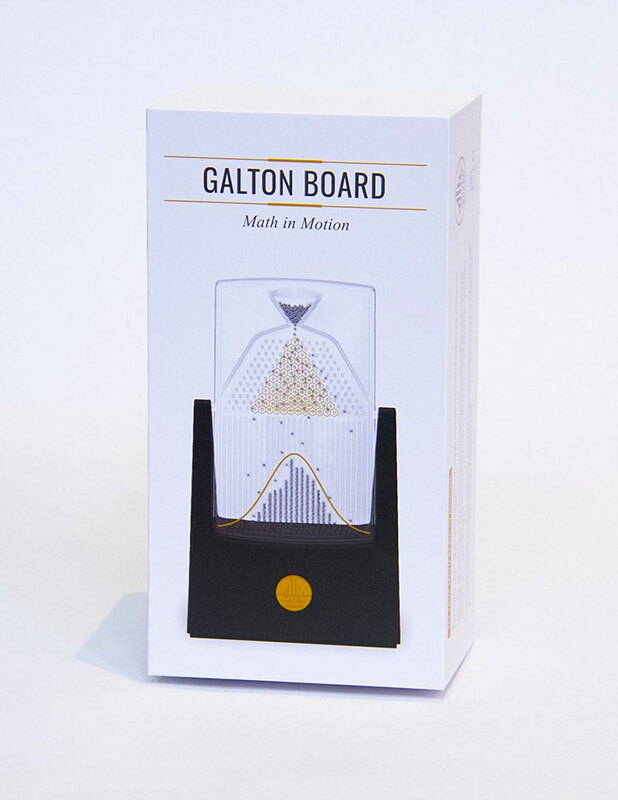 From the bell curve and binomial distribution, regression to the mean and stock market returns, the Galton Board is a nifty little teaching piece / gift for a geek that consolidates a ton of different centuries-old math concepts into one little (semi-)artistic display piece. 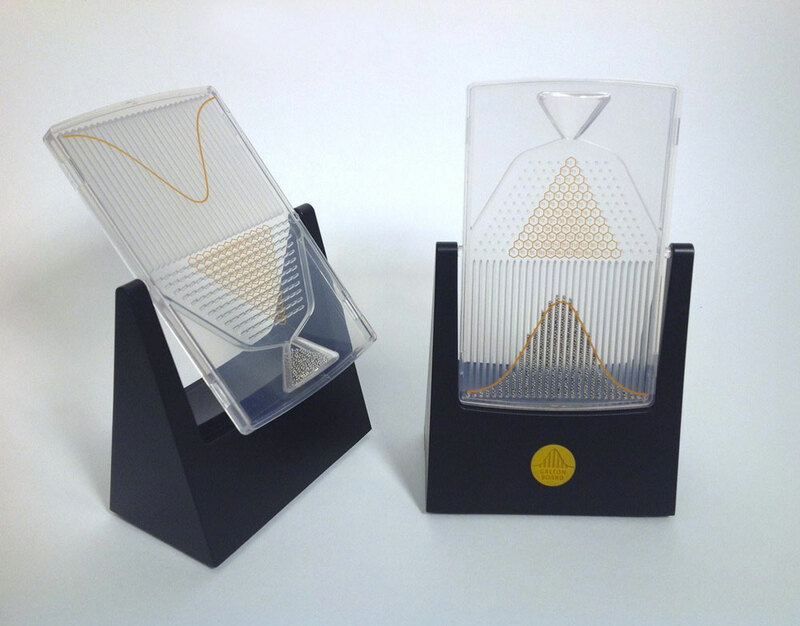 The Galton Board is modeled after an 11' Charles and Ray Eames "Probability Machine," shown at the 1961 Mathematica exhibit. Sir Francis Galton�s illustration of the binomial distribution, or bell curve, is front and center, depicted in approximation by the way the Board's 3,000 metal beads will tend to divvy up in their tubes when you dump them over, and then let them Plinko back down. A superimposed Pascal�s Triangle sees a number at each peg, representing the number of different paths a bead could travel from the top peg to that peg. You can find Fibonacci numbers as the sums of specific diagonals in Pascal's Triangle.